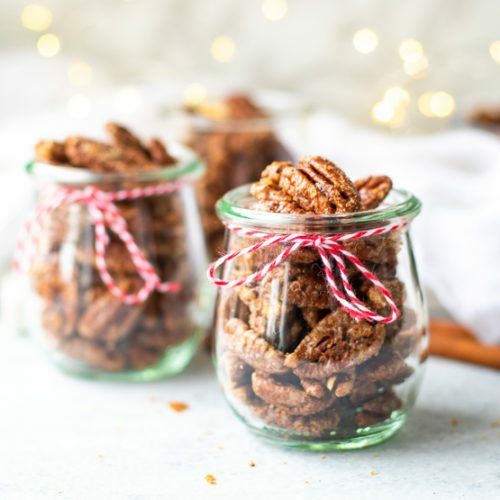 These Cinnamon Spiced Pecans & Pepitas make a great holiday appetizer, snack, or easy food gift! Made with just 4 ingredients and no egg whites, it's an easy, vegan appetizer! Preheat oven to 300°F. Prepare a large baking sheet fitted with parchment paper. In a medium bowl, whisk sugar, maple syrup, and cinnamon until the sugar dissolves and the glaze is smooth. Add the nuts or seeds. Toss to coat. Spread nuts onto the prepared baking sheet in a single layer. Roast 20 minutes, turning once. Remove from the oven, add the salt evenly and stir the nuts to prevent from sticking to the parchment. Let cool completely. Store cooled nuts in a sealed glass jar.